Here is a request from a Member on saving chart settings and applying them to multiple stocks. All I want to do is design a chart setup with certain indicators and a particular time frame and use that one setup for all of the symbols in my watchlist. 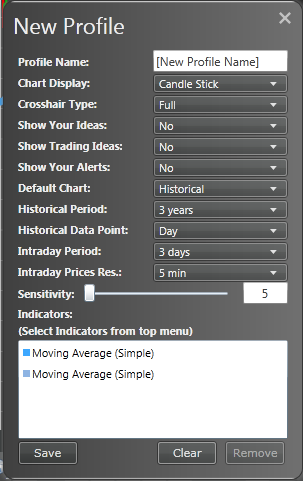 I want to click on each symbol in my watchlist and have that symbol appear within the chart setup that I have created and saved. From the Chart header menu, select "Period"; from this menu choose "3 Years" - a tick will appear next to the selected period. You don't have to change it from Daily prices. Along the bottom of the chart is a slider covering the 3 Year Period. Note: This step loads the past 3 years of data, but to display the 3 years you will need to drag the timeframe slider back. Manually adjusting in this fashion retains the display period when switching between stocks, but it's also influenced by the Profile bug above. Again, from the header menu, select "Profiles" and "New": You should see this. Go back to "Profiles" in the menu bar and choose "Apply"; you should see the 'Default Profile' and the 'New Profile Name' you have just created. While viewing a chart, switch between the newly created Profile and the default one. Rinse and Repeat with your chosen indicators to create personalised Profiles. 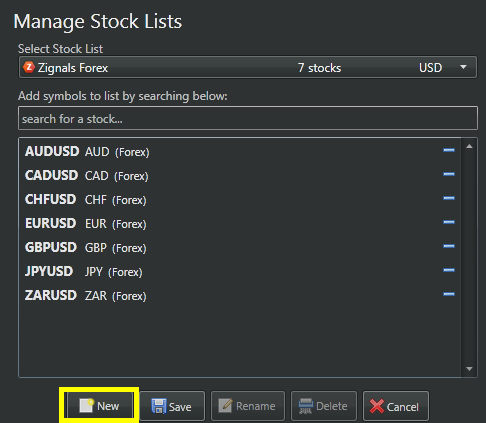 In the New Alert window, select the radio button next to "Select Stocklist"
Once your stocklist is created you can start adding stocks at this point from the search bar. Head back to Charts after your stocklist is created. Stocks can be added to the list directly from Charts (in the 'Chart' menu of Charts); when in the Chart menu, click [+ Add to Stocklist] and select a stocklist to add the viewed stock too. Note: Stocks can't be added to read-only Zignals stock lists. Next select 'Multiview' from the Chart menu. A menu will slide in from the left with a default Zignals list loaded. Select your newly created stocklist from the Stocklist dropdown menu. Underneath the Stocklist dropdown is a [View Entire List] button; select this to load your charts, displayed 4 at a time with a scroll bar to the right to display more charts. Selecting an individual chart in Mutliview will bring the screen back to single view; select Mutliview from the Chart menu to reload the multiview format. With you charts in multiview, select the newly created profile from the Profiles menu to apply the look to your charts. I want to do is design a chart setup with certain indicators and a particular time frame and use that one setup for all of the symbols in my watchlist. I want to click on each symbol in my watchlist and have that symbol appear within the chart setup that I have created and saved.